Mount Gillen is a mountain ideal for an adventurous hiking. The walk to the peak is pretty steep and is recommended only for physically fit visitors. Mount Gillen is otherwise naturally beautiful with Yellow-rumped Thornbills, Crimson Chats, Grey honeyeaters and Western Gerygone. Poles are useful on the ascent and descent as the trail is loose and rocky in parts. Be careful on the scramble to get to the summit. Avoid visiting the place during summer. How popular is Mount Gillen? People normally club together Alice Springs Desert Park and Larapinta Trail while planning their visit to Mount Gillen. Gorgeous 360 views but not for the faint hearted!! Took around 1hr up and 40min back. Highly advise plenty of water and good hiking boots. I found finding the start of the walk very hard, it's not signed posted. This was how I went: from John Flynn's Grave cross the bridge to left of the memorial (photo 2). Take a hard right just after the bridge. Follow the riverbed (photo 1) until the path starts off the left. This was the tricky bit, the start of the path has been severely washed away and so looks like a crack in the earth, not a path (photo 4). Then just stick on the path. Note that the last few metres to the top of the mountain are a nearly vertical climb (photo 5). 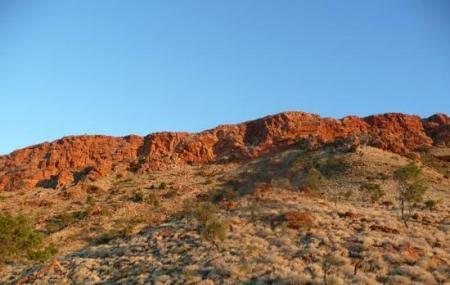 Best views in all of Alice, and one of the best sunrises (photo 3) I've ever seen!! My favourite attraction in Alice. Climbing mount Gillen for sunset is a must.